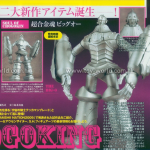 Figure King scores a look at the prototype Soul of Chogokin Big-O by Bandai. This mecha has long been overlooked and fans have wanted a toy of it for years. There have been attempts to make one, even Bandai tried with a 12″ electronic version slated to hit the US almost 10 years ago. Now this design will finally be immortalized in chogokin form. Click on the thumbnail to the left to take a closer look! 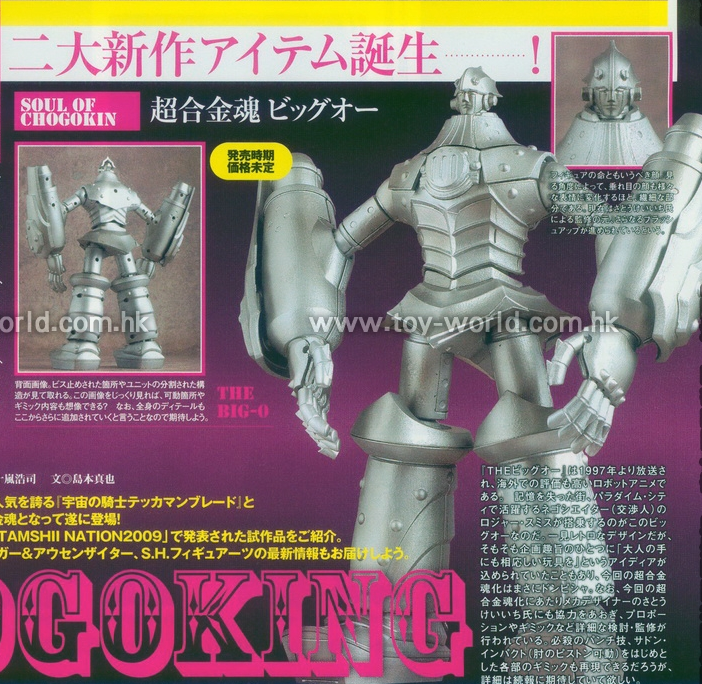 Figure King has shown the prototype of the upcoming BIG-O SOC figure by Bandai. This is the first diecast Big-O toy to see release, as others were cancelled. Click here to check it out! I couldn't be happier about this. The big steampunk deserves a whole line. Now if we can at least get a second Big Duo figure... I would crap my pants. Now if we can at least get a second Big Duo figure... I would crap my pants. I think it's possible. Bandai has made some obscure mecha and their rivals in their SOC line, as well as their Soul SPEC line. I hope to see Big Duo and others. Big Fau would be an obvious choice as well, but Archetype would be awesome to have as well. I would love to see the robot from Bring Back My Ghost, though it was only for a couple seconds. Too much to ask? Probably. Same here! Man come to think of it, I have no SOC's yet. They had also made big duo that way. That came with his pilot in that same inaction type scale. But the bots themselves are still very poseable. It was the same line that had the escaflowne mecha as well. Among others. Mostly carried by Suncoast stores, and back endcaps of toys r us in the 90s. Bandai has also made several Model Kits of him for Japan. Some with real spring loaded steam hammers. This version looks to be the first Die-cast version though. Wonder how heavy this sucker comes in at. *Edit* Nvm just saw the die-cast comment in the post. Didn't see that on the front page. The front page misleads like this is the first ever Big O robot figure ever. I just hope he comes with spring loaded steam hammers. Otherwise the model kits will still be vastly superior to this. Yo snowflakian I had picked up that Big dou figure of which you spoke, damned good figure too had interchangeable wing flaps and came with roger in his sunglasses doing the "showtime" pose with his watch and angel. But I wonder if they'd remake him like this as well as the second version. And scarecrow, are there any full pics of that crazy mech in bring back my ghost? You only really get to see him for a little bit before it gets crushed under old paradigm city. Not a perfect view, but enough to make something off of it.. Assuming the arms are the same on both sides..
P.S. I had the Big Duo as well. It's one of my favorite figures. My only problem with it was that the legs always seemed to be flopping about. The arms were surprisingly well articulated though, and didn't hang at all. Full Thread: BIG-O SHOWTIME SOC Style!